I used to get pretty upset with the commercialism of Christmas. But the older I get the less concerned I become. I would never want a statue of Santa Claus in my house. I was afraid of corrupting the true meaning of Christmas. I’m not so severe anymore. Santa doesn’t bother me. 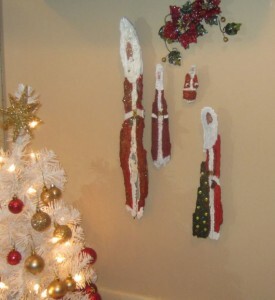 I actually have a small collection of “Wall Santa’s” given to me as gifts from a friend who made them by hand from pieces of bark from a tree. Think about it! Santa make from a tree! Now when I see Santa, I don’t think about the commercialism so much. I remember St. Nicholas, the fourth century Christian, who lived a legendary life of kindness, gentleness, mercy, compassion, and generosity. Those traits should actually characterize us all during the entire year but especially at Christmas time. I should endeavor to be that way to others. The joyful, bright, bubbly character is simply an icon of the joyful kind of life every believer should be living. He’s the antithesis of Scrooge! I used to dislike the idea of Christmas trees in the house because of Jeremiah’s warning against the pagan worshippers who cut down trees and brought them into their houses to worship them (Jeremiah 10:3). But today when I see the tree and reflect on it, I can’t help but think of the tree in Genesis 3. The first man and woman took from a forbidden tree and brought sin into the world. But the second Adam, Jesus, took the fruit of that sin and bled and died on another tree to pay the price of that sin for me. When I smell the scent of evergreen, I’m reminded of the new life I enjoy because of what Jesus did on His tree for me. Jim Wilson talked about the ornaments. He wrote, “The ornaments hanging on the tree also remind me of what Jesus has done for me. When I see the red ones, I think about the blood of Jesus that He shed for my salvation. The silver and gold remind me of God’s blessings in my life and the candy cane reminds me that Jesus is the Good Shepherd (1 Peter 5:4). The white stripes remind me that Jesus was sinless (2 Cor. 5:21). The red stripes that he shed His blood for me (Ephesians 1:7). Both colors of stripes remind me that my spiritual healing comes only through His stripes (Isa 53:5).” Unfortunately Jim is not a “star” on the top guy like I am so he says, “The angel on the top reminds me of my responsibility to tell the world that Jesus has come, just as the angel of old did (Luke 2:10).” In the final analysis all the decorations and icons of Christmas are nothing more than symbols. You make them what you want them to be. I’m praying that the images of Christmas will point you in the right direction and be the final destination in and of themselves.